DANOBAT’s sheet metal division, which specialises in the manufacture of tailored solutions and efficient technology in the sheet metal market, will again be represented at the coming edition of the Spanish Machine Tool Biennial (BIEMH), which is being held from 28 May to 1 June, at the Bilbao Exhibition Centre (BEC). These solutions will be on display at the joint stand organised by the DANOBATGROUP, an industrial group to which Danobat’s sheet metal division belongs. Here, you will be able to appreciate the latest solutions in advanced manufacturing by its well-known brands DANOBAT and SORALUCE as well as the consolidation of its services for digital industry. At stand C/03 in pavilion no. 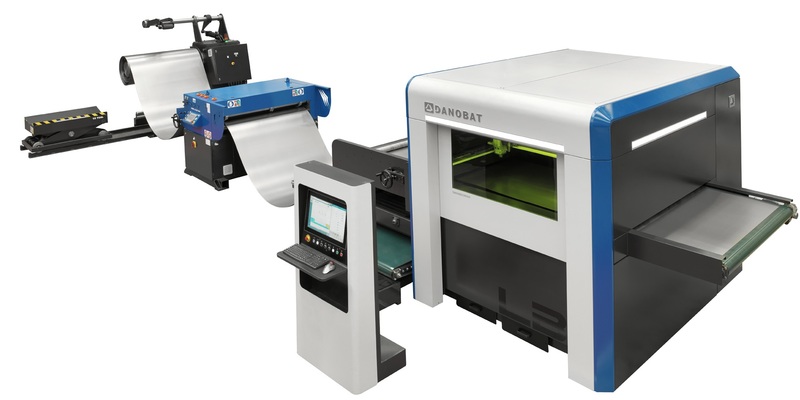 5, with an exhibition space of 720 square metres, DANOBAT’s sheet metal division will present the most innovative solutions in metal coil-fed laser cutting technology, including a demonstration of its solutions in the field of digitalisation. At the BIEMH, you will have the chance to see the DANOBAT LB coil-fed laser cutting machine, a high productivity solution that combines all the advantages of fiber technology applied to laser cutting (efficiency, speed, versatility, minimum maintenance, etc.) with the benefits of metal coils (savings in material costs of up to 15% and a more efficient use of sheet metal). The main objective of this concept is to make significant savings in the material to be transformed and a considerable increase in productivity deriving from the reduction in machine downtime. The machine has numerous advantages, among which particularly noteworthy are the possibility of separating scrap and managing dynamic nestings with the automatic classification of finished pieces. In addition, it offers the possibility of different automation solutions, both for coil feed as well as for the automatic stacking of the finished piece. The DANOBAT LB machine can be combined with different bending solutions, to get a complete flexible line in just one system. Cookware: discs for saucepans, frying pans, paella pans, knives, etc. Included in the wide offer of digital services that the sheet metal division is to present at the BIEMH is Smart HMI, integrated in the DANOBAT LB machine on display at the fair. It aids in machine operation and allows access to information on the status of the equipment and its working in real time. The main advantages of this service are the equipment’s increased availability, the logical handling of the control, aid in programming and the presentation of specialised machining cycles. It includes an interactive machine maintenance module which alerts to the need for the application of preventive maintenance measures. Additionally, it offers facilities for assisted maintenance, such as help for fault finding and recommended recovery plans, as well as graphs on energy consumption. Another digital solution included in the equipment on display at the BIEMH is DATA SYSTEM, a powerful analysis tool that gathers data generated by the machine and manages them to get the best from the machine. This tool includes a variety of options, such as the monitoring of the machine process in real time, the management of alarms and energy consumption. It also generates productivity reports. The people in DANOBAT’s sheet metal division are specialists in the design and manufacture of high value-added solutions for metal working. They offer innovative and technologically advanced services, tailored to suit their clients’ needs. For them, each project is unique, and they work together with their clients right from the idea to the service: they analyse their needs, and identify key processes for improvement; they design innovative, tailored solutions to optimise their production process; they implement the solution, passing on all their knowledge and accompanying them throughout the machine’s useful life, improving maintenance strategies, incorporating technological advances and optimising production. As a consequence of this customer-oriented policy, the analysis of the client’s needs and their experience, they have developed innovative solutions for the sheet metal cutting and bending world, which you can discover at the BIEMH 2018. DANOBAT’s sheet metal division has been offering tailored solutions and efficient technology in the sheet metal market throughout the world for over 50 years. As well as laser technology, they are specialists in punching, automatic bending, flexible metal sheet and combined punching and shearing and punching and laser cutting lines.